Consumers within a target market differ in the amount of elapsed time between their exposure to a new product and their trying it. That is described by the different stages of the consumer adoption process. But what are the factors influencing the adoption process? In this article, we will take a closer look at them. First of all, what is adoption? Adoption is an individual’s decision to become a regular user of a product. The adoption process is the way how consumers arrive at this decision: The mental process through which an individual passes from first hearing about an innovation to final adoption. How do consumers learn about new products, try them, and finally adopt or reject them? Clearly, not every consumer arrives at the adoption or rejection in the same way. Likewise, the time it takes from first exposure to a new product and the trial differs greatly. 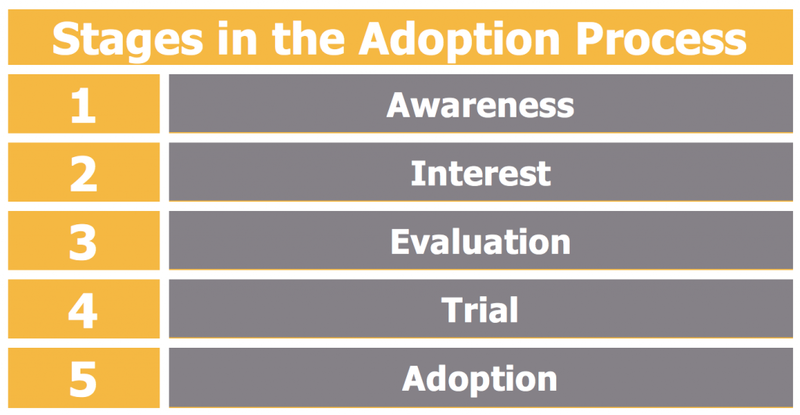 To understand this, let’s look at the different stages in the adoption process. In the awareness stage, the consumer first becomes aware of the new product, but he still lacks information about it. In the interest stage, the consumer is stimulated to seek information about the new product or innovation. In the trial stage, the consumer tries the innovation to improve his or her estimate of its value. In the adoption stage, the consumer decides to make full and regular use of the innovation. Every of these stages can differ in length and intensity, leading to a different adoption process. We will now investigate the factors influencing the adoption process. In each product area, there are consumption pioneers and early adopters. These people are the first to adopt new products, fashions or appliances. Other individuals adopt new products much later. People can be classified into five adopter categories. After a slow start, an increasing number of people adopt the innovation, the number reaches a peak, before it diminishes as fewer nonadopters remain. Why do people differ in their readiness to try new products? The reason can be found in people’s value orientations. Innovators are venturesome, they are willing to try new ideas. Early adopters are guided by respect, they are opinion leaders in their community and adopt new ideas early but carefully. Next, the early majority is deliberate, they adopt new ideas before the average person, although they are rarely leaders. The late majority is sceptical, they adopt an innovation only after a majority of people have tried it. Finally, laggards are tradition bound, they are rather suspicious of change, mix with other tradition-bound people, and adopt the innovation only when it takes on a measure of tradition itself. What does this mean for companies? An innovating firm must research the demographic, psychographic and media characteristics of innovations and early adopters and direct communications specifically to them. Going further in the factors influencing the adoption process, we find the effect of personal influence. Personal influence is the effect one person has on another person’s attitude or purchase probability. Although personal influence is an important factor, its significance is greater in some situations and for some individuals than for others. Personal influence is most important in the evaluation stage of the adoption process. In addition, it has more influence on late adopters than early adopters. It also is more important in risky situations. 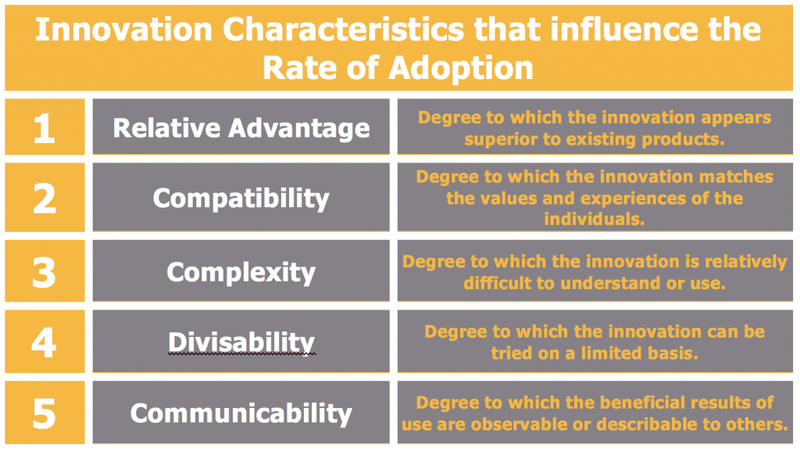 Finally, of course the characteristics of the innovation belong to the factors influencing the adoption process. Understanding the different factors that influence the adoption process helps understand the adoption or target consumers and thereby enables to design effective marketing strategies. Ways to specialize for Market Niches – How to occupy Market Niches?